Organophosphate esters (OPEs) are a kind of emerging contaminants, but the information about their pollution profile and ecological risk are still scarce in China. In this study, 31 surface water samples of Haihe River (China) were collected in November 2017, and 11 OPEs were measured, and the ecological risk of OPEs was assessed by means of species sensitivity distribution (SSD) method and assessment factor method. Additionally, Pearson correlation analysis and an international comparison with other rivers in the world were conducted. The results showed that total OPEs ranged from 23.98 to 824.72 ng L−1, and the mean value was 228.70 ng L−1. The concentration of OPEs decreased as follows: Tri(2-chloroisopropyl) phosphate (TCPP) > Tri(2-chloroethyl) phosphate (TCEP) > Triethyl phosphate (TEP) > Tributoxyethyl phosphate (TBEP) > Triphenyl phosphate (TPhP) > Tripropyl phosphate (TPrP) > Tri(2-ethylhexyl) phosphate (TEHP) > 2-ethylhexyl diphenyl phosphate (EHDPP) > Tri(1,3-dichloro-2-propyl)phosphate (TDCPP) > Tri-n-butyl phosphate (TnBP) > Tri-m-cresyl phosphate (TMPP). TCPP (19.54–160.82 ng L−1) and TCEP (N.D.-151.99 ng L−1) with the mean value of 76.67 and 53.13 ng L−1 respectively were identified as the richest OPEs in Haihe River. The concentration of OPEs slowly increased in the upper reaches of Haihe River, and it tended to be stable in the middle reaches of Haihe River and decreased rapidly from the downstream to the outer sea. Significantly positive correlations occurred among three chlorinated alkyl OPEs (TCEP, TCPP, and TDCPP), suggesting that they might come from the same source. Based on the comparison, the pollution condition of OPEs in Haihe River was low, and TCEP was found to be the most abundant OPEs in China but it was not that in Europe. The ecological risk assessment on the basis of assessment factor method suggested that the risk of OPEs in Haihe River for algae, crustacean, and fish was limited. In addition, the results of SSD method suggested that the combined ecological risk of four OPEs in Haihe River was also low. 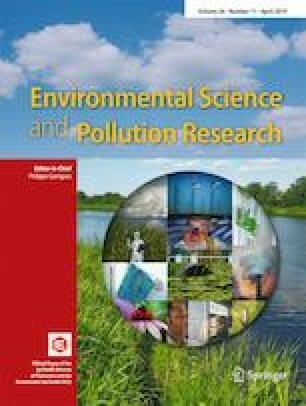 This study provides information about the pollution status of OPEs in the surface water of China to some extents and a project for the risk estimation based on SSD for prior and emerging flame retardants. The online version of this article ( https://doi.org/10.1007/s11356-019-04461-2) contains supplementary material, which is available to authorized users. This project was funded by the National Nature Key Research and Development Program of China (2016YFC0401108), Tianjin Municipal Science and Technology Commission (18YFZCSF00740), the National Major Science and Technology Program for Water Pollution Control and Treatment (No. 2012ZX07203-002-005), and the Fundamental Research Funds for the Central Universities of China.